1) 'is' as in identity; Saul is Paul. 2) 'is' as in predicate; Paul is Christian. 3) 'is' as in subset; Paul is a Man. (Paul is a member of the class 'Men'). 4) 'is' as in existence; God is. "The Father is God. The Son is God. The Holy Spirit is God, and yet the Father is not the Son, the Son is not the Holy Spirit, the Holy spirit is not the Father." what meaning they ascribe to the word 'is'. Please feel free to give the different answers according to the different branches of Christianity. Addendum: If the answer is 1), identity, how do Christians get around the problem of the Transitivity of Identity' If A = B & B = C then A = C? The Father is God. The Son is God. The Holy Spirit is God. the Father is not the Son, the Son is not the Holy Spirit, the Holy spirit is not the Father. Only active spiration is not in opposition to paternity and to filiation, and so it has as subject both Father and Son; but it is in opposition to passive spiration, which therefore demands a distinct terminus (the Holy Spirit). Of the four real relations in God, three are numerically distinct and, thus, constitute the three divine Persons: the Father, who is subsisting Paternity, the Son, who is subsisting Filiation, the Holy Spirit, who is subsisting Spiration of Love. Think of a human example: a mother and daughter. No matter how united a mother and daughter may be, their relations are still opposed to one another; the mother→daughter and daughter→mother relationships can never meld into such a relationship where the daughter relates to her mother in the same way the mother does to her daughter (e.g., becomes her own mother, vice versa, or both!). In God, each of the four Divine Relations is God, i.e., has the same Divine Essence (which is His existence). 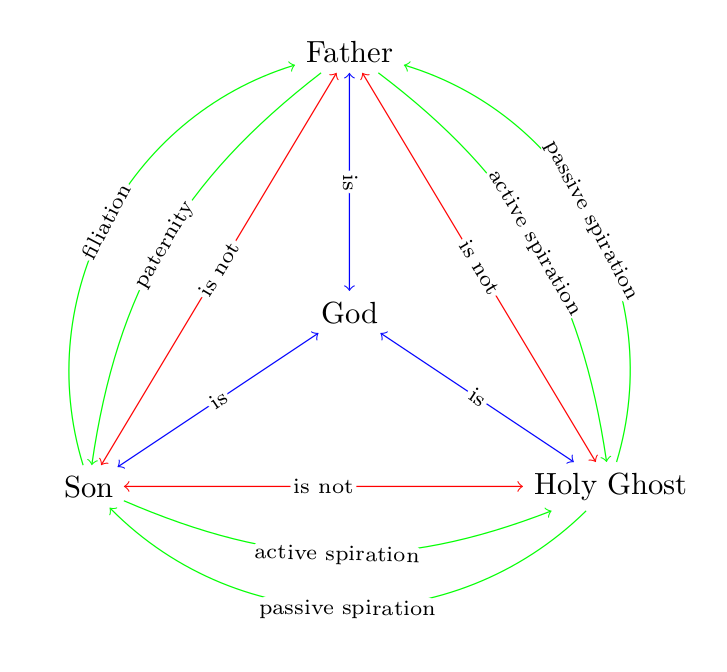 Three of these relations are opposed to each other: paternity, filiation, and passive spiration (cf. this). In creatures, relations are extrinsic to the essence of the creature. For example, my essence* is humanness, but my relation to my father, mother, wife, friends, or even to God is not humanness; it's not my essence. But in the Holy Trinity, the Divine Relations are the essence of God Himself. This is a consequence of the Trinity being supremely simple. Some essential names signify the essence after the manner of substantives; while others signify it after the manner of adjectives. Those which signify it as substantives are predicated of the three Persons in the singular only, and not in the plural. Those which signify the essence as adjectives are predicated of the three persons in the plural. The reason of this is that substantives signify something by way of substance, while adjectives signify something by way of accident, which adheres to a subject. Now just as substance has existence of itself, so also it has of itself unity or multitude; wherefore the singularity or plurality of a substantive name depends upon the form signified by the name. But as accidents have their existence in a subject, so they have unity or plurality from their subject; and therefore the singularity and plurality of adjectives depends upon their "supposita." In creatures, one form does not exist in several "supposita" except by unity of order, as the form of an ordered multitude. So if the names signifying such a form are substantives, they are predicated of many in the singular, but otherwise if they adjectives. For we say that many men are a college, or an army, or a people; but we say that many men are collegians. Now in God the divine essence is signified by way of a form, as above explained (a. 2), which, indeed, is simple and supremely one, as shown above (q. 3 a. 7; q. 11 a. 4). So, names which signify the divine essence in a substantive manner are predicated of the three persons in the singular, and not in the plural. This, then, is the reason why we say that Socrates, Plato, and Cicero are "three men"; whereas we do not say the Father, Son, and Holy Ghost are "three Gods," but "one God"; forasmuch as in the three "supposita" of human nature there are three humanities, whereas in the three divine Persons there is but one divine essence. On the other hand, the names which signify essence in an adjectival manner are predicated of the three persons plurally, by reason of the plurality of "supposita." For we say there are three "existent" or three "wise" beings, or three "eternal," "uncreated," and "immense" beings, if these terms are understood in an adjectival sense. But if taken in a substantive sense, we say "one uncreated, immense, eternal being," as Athanasius declares. A suppositum is an individual substance. Short answer is, “identity.” Each Divine Person is perfectly identical to the Divine Essence. Perhaps the best exposition of this idea is given by St. Thomas Aquinas in the Summa theologiae [S.Th.]. However, in God there are no “accidents;” rather, whatever perfections creatures derive from their accidents, God possesses in their fullness in His very Essence (or Substance). In other words, although we creatures need to use two different notions to signify the Divine Essence and each one of its intrinsic relations (including the Persons), in reality, the notions refer to the very same reality. To use Frege’s terminology, we could say that Divine Essence and the Person have the same Bedeutung (reference) but differ in Sinn (sense). When speaking of theology, there is the usual caveat that the concept of being or existence (“is”) changes according to the subject, in a way that perhaps Frege did not consider in his logic. The greenness of the tree is (exists). John (a man) is (exists). “God is good”; this is not merely a predicate of God, but is identity. God is His goodness. It is also His very being—He is Goodness Itself. Answer to addendum: why this does not violate transitivity. Remember, “is” changes in meaning depending on the subject to which it is predicated. The being of God is special: God does not simply “exist,” the way His creatures exist; He is best characterized as Being Itself (Ipsum Esse, in St. Thomas Aquinas’ lingo). What that implies is that the being (existence)* of every creature is a participation in God’s Being. The Persons, however, don’t merely participate in God’s Being, they possess it completely. And they possess the very same Being. And when we predicate the verb “to be” to the Divine Essence, we mean it in this very special sense: that He is Being Itself. However, when we use the verb “to be” to distinguish Persons, the meaning changes, because the only way to compare two relations is by analyzing he terms of those relations. The Father is not the Son, because the Father is Unbegotten (a term of the relation of Fatherhood) and the Son is Begotten (the other term). And vice versa, regarding the Sonship of the Son. The Father and the Son are not the Holy Spirit, because the Father and the Son are one term of the relation of spiration, and the Holy Spirit is the other (and vice versa, regarding procession). we mean “the Father possesses all the Divine Being, which is His Essence” (and so forth with all the Persons). If you will, the use of the same symbol (=, or the verb “to be”) fools us into thinking the meaning is the same. In reality, in proper theological terminology, we would say, “The Father is really distinct from the Son,” etc. The Persons are really distinct, because we are comparing the relations to one another, and, in fact, the terms of the relations are different (unbegottenness vs. begottenness, spiration vs. procession). * It should be kept in mind that Aquinas distinguished very carefully between exsistentia (existence) and esse (being), a distinction that was largely lost in St. Thomas’ commentators (Cajetan, Francesco Silvestri, etc. ), and certainly by Duns Scotus and Suarez. For Aquinas, Esse means the perfection or—more precisely, the act—of being, which is more than the mere “fact” of being. Exsistentia, on the other hand, means the presence or emergence of being to some kind of observer. A thing “is” whether or not we perceive it. It “exists,” strictly speaking, when we are aware that it is. In English, too, the distinction is largely lost. When we say "Son is God; Father is God; Spirit is God", the "is" is of predicate for property or essence; the option (2). The three persons in Trinity shares divine property. On the other hand it is (1) when we say Son is not Father, we use "is" for identity. The three are not a single person sharing different roles or names. They are three persons sharing same nature; they are one being. To quote a top Christian philosopher and theologian Dr. Craig in his debate with Shabir Ally - The concept of God in Islam and Christianity. Now, that puts the Muslim in a difficult situation, because the Qur’an says Jesus was a prophet. And therefore, you must believe what he said. But Jesus claimed to be God’s Son, equal to God to sit at his right hand. So if you believe that, you cannot be a Muslim. So, you see, Islam sort of pulls the rug out from under itself. If you believe in Islam, you have to believe what Jesus said, but if you believe what Jesus said, you can’t be a Muslim. So, it’s caught in a vicious circle. But again, I don’t want to distract the debate to be a debate tonight about the deity of Christ. I want to simply say, let’s assume the Christian doctrine of the Trinity is what it is, and the question is, Is that rational to hold to? And all Shabir actually could say here was that in a triangle, each angle is not a triangle; but according to the doctrine of the Trinity, each person is God. This is simply based on a misunderstanding, Shabir. The “is” in the statement “Jesus is God” is not an “is” of identity. It’s not like saying “Cicero is Tully,” where those are simply two different names of the same person and the “is” of identity. Rather, this is an “is” of predication. It’s like saying, “The couch is red.” You don’t mean that the couch is a color, you mean that the couch has the property of being red. Similarly, when it is said, Jesus is God, the Father is God, the Son is God, that is to say that they are all divine; they all share the attributes of deity. This is not an “is” of identity. And unless you understand that, you’re bound to be confused. So, it is simply not the case that according to the classic doctrine of the Trinity that the Godhead as a whole is identical to any one of the persons. It is very much like a triangle, where you have one entity comprised of three angles or one entity comprised of three persons. And if that is the doctrine, then I ask you, “What is rationally objectionable about that?” That is the doctrine I believe, and I see nothing irrational about it. For further study, read the transcript of his podcast on The Doctrine of Trinity. If A = B & B = C then A = C? First of all Frege identified four different meanings of the word "to be". This does not mean that there cannot be more meanings Frege did not know. And second you should have a look on the word "identity": If the word "to be" has at least four different meanings - why should the word "identity" have only one meaning? The word "is" cannot be meant in the way it is used by a mathematician. As one not raised or well versed in the Christian faith ... the different branches of Christianity. Catholic and Lutheran theologians (!) use the same words but they have a different understanding what these words exactly mean. Therefore they often are not able to understand each other. So it's likely that some of the answers given will be understood incorrectly be readers belonging to a different branch of Christianity. Not the answer you're looking for? Browse other questions tagged trinity persons-of-the-trinity logic metaphysics or ask your own question.